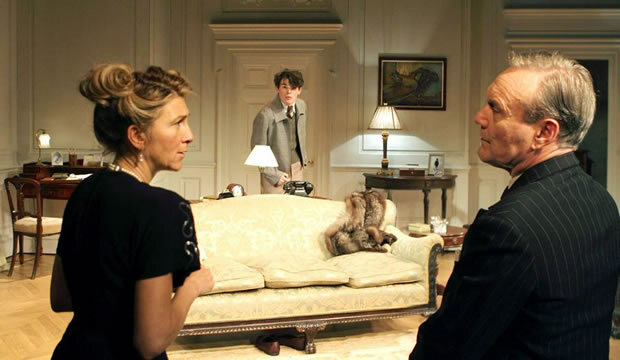 "the play still manages to strike home"
After a sold-out season at the ever-popular Menier Chocolate Factory, Terence Rattigan’s drawing-room drama and wartime comedy Love in Idleness moves over to the Apollo Theatre. It’s a different performance space; less intimate and subsequently less forgiving, but the play still manages to strike home. As the Brits slowly begin to believe they’ve won the war, evacuees are starting to be sent home, and so Michael returns to London, only to discover his mother has become the mistress of a very prolific, very right-wing cabinet minister. Armed with his left-wing ideologies and firm love for his “poor mum”, hilarity, chaos and clashes ensue. Olivier Award-winner Eve Best is glorious as Olivia, constantly providing laughter with her genuine, innocent performance. She’s perfectly polite, even when Michael manipulates her into moving away from the love of her life – no easy feat. It’s almost as though she wants to break into laughter after every line, complimenting the slightly more serious, contained performance from Anthony Best as John Fletcher. Edward Bluemel is simply brilliant as the sulky, brattish Michael, who consistently puts his own happiness first. He’s the perfect youth, bubbling with sparky ideologies and a hilarious penchant for acting like Hamlet. In particular, his tryst with Diane Fletcher is wonderfully performed, revealing just how immature he really is. On the surface, Love in Idleness is a completely innocent comedy, but there’s something darker bubbling beneath the humour. Trevor Nunn’s detailed direction ensures that the actors don’t play for laughs and that moments of truth still shine through. We see Olivia’s genuine sadness and John Fletcher’s frustration, all set against a backdrop of complete social change. It resonates and remains startlingly pertinent, even now. But it’s difficult not to notice the difference between the production playing in a larger theatre compared to the more intimate Menier. It lacks pace at moments, and snippets of truth occasionally get lost in the Apollo’s bigger auditorium. It’s brilliant when a good show transfers to the West End, but sometimes it’s better to see success in a smaller venue.